The passage of time can destroy or crystallize your opinion of just about anything. In the world of cinema, films can become dated or with hindsight, look quite prescient. 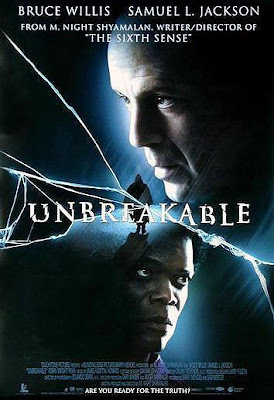 M. Night Shyamalan's Unbreakable falls into the category of the latter. The visually arresting movie is the earliest example of American cinema examining the mythos of comic book superheroes with reverence. Misunderstood at the time of its release because of an ill-conceived marketing campaign designed to sell it as another Sixth Sense, it calls for a reexamination in light of last year's release of The Dark Knight. Like that film, this one takes the mythology of superhero graphic novels quite seriously, grounding the players in a real world, and burdening them with the same kinds of problems people deal with on a daily basis. Unbreakable is about two men who seem to be mirror images of each other-reflections and refractions will be a running motif. David Dunn (Bruce Willis) is a melancholy security guard who is in the early stages of separating from his wife, Audrey (Robin Wright Penn), and keeps his son, Joseph (Spencer Treat Clark), at a distance. Elijah Price (Samuel L. Jackson) is a wealthy dealer in comic book art who has insulated himself from the rest of the world because of a condition that causes his bones to break at the slightest impact. David is the sole survivor of a train wreck which brings him to the attention of Elijah. Elijah believes that if he is a man on one side of the spectrum of fragility, his opposite number, a man of superhuman strength, must reside at the other side of the spectrum. It all makes sense to David's son Joseph, a comic book fan who is looking for anything special to elevate his rather ordinary, estranged father. Elijah's relentless harassment of David and his family concerns him. David only sees an overgrown, bitter, isolated individual who has started believing in the comforting graphic novels he grew up with while real relationships eluded him. But Elijah is correct in asking David if he's ever been sick. He hasn't. And Elijah astutely suggests that the car accident that once sidelined David's promising football career may have simply been an opportunity for him to leave a sport which his then-girlfriend Audrey found repulsively violent. Shyamalan takes some of the conventions of superhero mythology and builds his own iconography around it. David's alliterative first and last name, for example, is common to superhero's secret identities, i.e. Peter Parker/Spider-Man or Bruce Banner/Hulk. Yet his depiction of David's environment in drab and industrial green tones is a cinematic expression. In the picture above, one can see how Shyamalan subtly frames the film's subjects frequently using columns, windows and the like as a subconscious reminder of the comic book panel, as first discussed by Jim Emerson at his movie blog, Scanners. That screen capture also implies the reflection motif discussed earlier with its inclusion of the chandelier in the frame. One man, unbreakable in body; the other, unbreakable in spirit, doggedly hoping to measure his own importance by confronting his opposite doppelganger; both are framed in the scene above. Here is an explicit framing of the two diametrically opposed men by the stadium bleachers, with David's past playing out behind them in the form of a football game at the stadium he guards. Once an active participant in the game, he is now an outsider relegated to overseeing its fans on the fringes. More of Shyamalan's use of color coding can be found in the cool blues and purples that dominate the screen whenever the crippled Elijah is onscreen. And his name is an evocation of prophecy, destiny, indiscriminate fate. Here, David is framed in the candy-colored hues of Joseph's world, a world of unfulfilled dreams and limitless potential sprung to life from Joseph's comic book sensibilities. Audrey and David on a first date since becoming estranged. With each experiencing a new lease on life since David's miraculous survival, their dreams become a possibility once more. The interior of the bar is lit like an exterior - lush, green, and with a hint of sunlight lining each silhouette. They are still in shadow, still haven't let go of the resentments; his over sacrificing his destiny for her, and hers over the wall he's built around himself. Here David is framed by the doorway in the dark, the long night of his rite of passage beginning with Elijah's message on the answering machine in the foreground. Framed again, this time by the train wreckage he survived, David wears his security uniform rain poncho as he remembers another wreck he lived through. The poncho evokes the capes so often found in superhero mythology. The weight of the past on his ultimate destiny, the superhero origin told in flashback is a comic book convention. In my mind (and perhaps only in my mind), this one recalls the staging of the origin on TV's Incredible Hulk (Bill Bixby/Lou Ferrigno), a TV show that was the first to show the same level of reverence towards a comic-book superhero. The train station sequence fuses all of the errant elements together, as David's destiny becomes clear to him. He has returned full circle to a train station, home to the same mode of transport that forced him to reexamine his life. James Newton Howard's score reaches an ominous crescendo during his sequence. Eduardo Serra's cinematography highlights evildoers - like the woman in the red jacket - with splashes of color whenever they brush up against David, as he instinctively reads their particular crimes committed. David, seen from behind with his palms pointing out, recalling similarly staged depictions of Jesus in biblical epics of the fifties like Quo Vadis (1951) and Ben-Hur (1959), where Jesus' face is given power by its absence from the frame. The crane shot depicts the emergence of the Messianically-lit David from the crowd of travellers, an abrupt shift in point-of-view reserved throughout the film for moments in which David's destiny comes to the fore. From the depths of hell - or at least the street below - a harbinger of evil rises toward the light: the evildoer that will prove to be David's first challenge. Out of the darkness and rain emerges the hero. The God's-eye point-of-view again, as the camera surveys the completion of David's journey - and its casualties - from above. Now a little more brightly lit, as David achieved a form of self-actualization last night. The dawn is taking hold for David and Audrey as their resentments recede with the shadows. David's gift to his son, a newspaper drawing of himself as a superhero. The family unit in the heart of the home - the kitchen - together at last. The once gloomy household now lit like an exterior also. The brightness of a new day for Audrey and David, and Joseph - now closer to his dad than ever - sharing his secret identity. The revelation that Elijah caused the train accident that set David on his path comes to him when he shakes Elijah's hand. A gloved hand, from the bitter man incapable of joining society, meets an outstretched hand, from a man who now knows who he is. David and Elijah are surrounded by the comic books that have, in their own unique way, defined who each is. David's joy is drained by Elijah's reveal, and the frame is overwhelmed by Elijah's cool-colored blues and purples. Elijah, eccentrically dressed as a criminal mastermind, realizes his own destiny as the villainous "Mr. Glass," or so he thinks. A virtual cipher all of his life, he still can't define himself without doing it through others: the teasing kids who invented the nickname, and David his superheroic opposite. This post was first published at Film for the Soul for its continuing series on the best movies of the 2000s, Counting Down the Zeroes, on 4/20/09. Thanks for the feedback, Mattson. Good luck on your film.